Healthcare in Sri Lanka is provided by the Government, private sector and, to a limited extent, by the non-profit sector. The country holds a unique position in South Asia as one of the developing nations to provide universal health, free education, strong gender equality, and better opportunity to social mobility. Public sector healthcare is universally accessible for the entire population and is almost entirely free of charge. Since its independence, successive governments have implemented welfare-oriented policies and programs which have allowed Sri Lanka to achieve relatively high standards of social and health development in comparison to countries of similar levels of economic development. The health system in Sri Lanka is enriched by a mix of allopathic, ayurvedic, unani and other systems of medicine. Of these systems, allopathic medicine has become dominant and is catering to the majority of the health needs of the people. The Health Ministry and the Provincial Health Services provide a wide range of preventive, curative and rehabilitative healthcare. The country has an extensive network of healthcare institutions. Sri Lanka has one of the most effective health systems among developing nations, with the vision of “a healthier nation that contributes to its economic, social, mental and spiritual development”. Sri Lanka has achieved much in health. The indicators pertaining to maternal health, infant health, several communicable and non-communicable diseases such as polio and other vaccine preventable diseases have shown considerable improvement. The maternal mortality rate of 39 deaths per 100,000 live births in 2010 was an exceptional achievement for a developing country. The improvement of these indicators is predominantly attributed to the Maternal and Child Care Programme implemented nationally as an integral component of the state healthcare system. Similarly, the current infant mortality rate has been achieved by effective and widely accessible prevention and primary healthcare strategies including the treatment of minor infections. However, while post-neonatal mortality has declined significantly, there has been less success in reducing prenatal and neonatal mortality. With the rapid ageing of the population and the success in combating the major communicable diseases, the disease burden has started shifting rapidly towards non-communicable diseases including mental diseases, accidents and injuries. Nutritional status has improved but remains a problem among the poorer and vulnerable communities and, even on average, is unsatisfactory. The leading causes of death are ischemic heart disease, diseases of the intestinal tract, cerebrovascular disease, pulmonary heart disease and diseases of the pulmonary circulation, and neoplasm. Over time infectious and parasitic diseases have declined in prevalence, while cardiovascular diseases have increased in a proportionate manner. The factors that have contributed to the Sri Lankan success in improving the health status of its citizens are cultural, social and historical. These include high levels of women’s autonomy and relative gender equality, a democratic system based on universal franchise and a significant level of consensus on national priorities relating to the government’s provision of social services. Free education since 1947 and high levels of female literacy have engendered changes in attitude and created a knowledge base that has weathered periods of economic decline. The nutritional status of poor families has been improved through subsidised distribution of rice, while water and sanitation systems have been developed in parallel to the health system. Spread of dengue fever has been one of the greatest challenges my Ministry has faced over the past two years. Removing breeding sites of dengue mosquito is the most important step in mitigating risks. A Presidential Task Force, consisting of several ministries and including the security forces, was deployed with health officials to carry out random inspections of homes, offices and public areas as well as to educate citizens and destroy the breeding sites of mosquitoes. Individuals, communities, institutions and countries can improve health when they work together. We are very grateful to the World Health Organisation, which played a great role in providing the technical support and coordination needed to make progress in health possible. The Democratic Socialist Republic of Sri Lanka (formerly Ceylon) is an island in the Indian Ocean, separated from south-east India (Tamil Nadu state) by the Palk Strait. It is almost linked to the Indian mainland by Adam’s Bridge, an atoll barrier, mostly submerged, lying between the offshore island of Mannar and India itself. The country comprises nine provinces (from south to north): Southern (provincial capital Galle), Sabaragamuwa (Ratnapura), Western (Colombo), Uva (Badulla), Eastern (Trincomalee), Central (Kandy), North-Western (Kurunegala), North-Central (Anuradhapura) and Northern (Jaffna). Tropical. The lowlands are always hot, particularly from March to May. The highlands are cooler. During December and January there is occasional frost on very high ground – for example, at Nuwara Eliya. The dry season is March to mid-May. The southwest monsoon season lasts from mid-May to September; the north-east monsoon season lasts from November to March. The most significant environmental issues are deforestation; soil erosion; coastal degradation as a result of mining activities and increased pollution; pollution of freshwater resources by industrial wastes and sewage; air pollution in Colombo; and the threat to wildlife populations of poaching and urbanisation. 21,098,000 (2012); 15 per cent of people live in urban areas. The population growth rate stood at 0.9 per cent p.a. between the years of 1990 and 2012. In 2012 the birth rate was 18 per 1,000 people (31 in 1970) and life expectancy was 74 years (43 in 1946 and 64 in 1970). The largest ethnic group is Sinhalese (estimated at 74 per cent of the population), followed by Sri Lankan Tamils (12 per cent), Muslims (seven per cent), Indian Tamils (five per cent), and small communities of Malays, Burghers (persons of Dutch or partly Dutch descent) and a small number of Veddhas, descended from the earliest inhabitants. 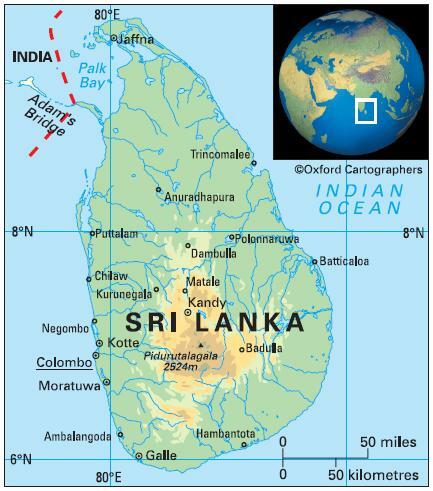 Sinhalese settlers arrived in the fifth and sixth centuries BC. Sri Lanka is classified as a lower-middle-income economy by the World Bank.